Vacuum Bag Stuff : Boatcraft Pacific, the home of wooden boat building. 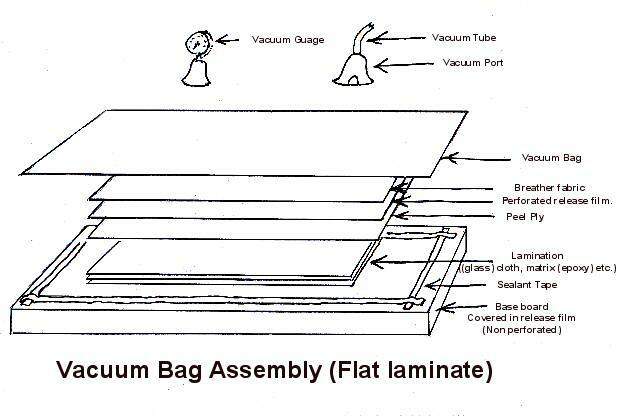 Vacuum bagging is often used in composite assembly. It is a great way to hold large assemblies together whilst the matrix (usually epoxy) hardens (think laminating sheets of plywood). Using a vacuum bag plus peel ply, perforated release film, and breather fabric is the best way to acheive optimum matrix to reinforcement ratio ( think super strong and super lightweight composites).